Our parenting journey began with the birth of Collin in October 1998. Becky and I were still young at the time, in our lower 20s. Both of our careers were still developing, but we decided that it would be best if she quit her job to stay at home with the kids. Those early years don’t last long and they are so critical in a childs’ development. Connor was born 15 months after Collin and then Colton about 3.5 years after him. That allowed Becky 8 or 9 years to be at home with the kids before they were all in school. She continued her education while she was at home though and became an RN so that she would have something to do when the kids reached school age. We do not regret the decision for her to be at home with the kids one bit. Our kids received a lot of one on one time and that has helped them tremendously in more ways than we probably know of. During their early years Becky and I read to them a lot and just simply spent time playing with them. I remember being on the floor a lot, letting them roll me around like a log. Blue Clues, Dora and the Wiggles were popular then as well. Collin learned to write by mimicking Steve and his Handy Dandy Notebook with a Magna Doodle that we had bought him and still to this day, I find myself singing songs like “Big Red Car” and “Fruit Salad, Yummy, Yummy”. Dora was a step ahead of Dave Ramsey, by saying, “Swiper, No swiping.” We took lots of pictures and videos and had a blast while they were young. As the kids grew older we started them off in T-ball for a couple of years and dabbled in gymnastics, but one day Collin came home from school with a martial arts book and expressed interest in trying that out. We researched a couple options and decided to go with TKD (Tae Down Do). After Collin started, Connor got in it, then Colton and I joined. Martial arts became a family thing that we did together for about 6 or 7 years. It was a large commitment, because we were at the school for several days a week, but we all eventually met our goal and became black belts. Collin and Connor even earned their second degree. During this time we also were introduced to a ministry called Bible Quizzing at our church and have since committed our lives to that. Bible Quizzing is a program that is meant to give kids motivation, through competition, for learning scriptures from the Bible, but we are not just talking a few scriptures. Our kids learned 300 to 500 verses each year depending on the age division they are in. We spend an hour or so each evening memorizing and reviewing scriptures together. They must know them to the point that given a unique word they can tell you what verse that word is found in and then quote the scripture word for word. I take them and other quizzers to local and national tournaments to quiz against other teams on what they have learned. Bible quizzing has changed our lives forever. If you are interested in learning more about it check out http://www.seniorbiblequizzing.com or http://www.upcquiz.com. Even with Bible Quizzing as our main focus, the kids still love to do things many other kids do. Connor made the middle school basketball team this year and Colton plays Upward basketball, a christian based basketball league sponsored by a local church. Collin started piano when he was 10 and has excelled at that. He performs multiple recitals each year and has joined the music ministry at the church, playing for the youth services as well as subbing in when needed for the main services. Collin has also become infatuated with the Rubix cube. He has spent countless hours mastering it to the point that he can now solve it in under 20 seconds average, with his best time so far being 12 seconds. Connor and Colton have recently began music lessons as well. One is learning guitar and the other drums. I play the bass, so my dream is that one day we can all play together as a family band. I share all of this with you so that as I write on parenting in 2014 you will know that we are just a typical American family, but we are also rooted and grounded in our christian faith. We love God and we love family and our main goal as parents is to make those things the foundation upon which our kids are raised. I look forward to writing on parenting this year. As we get deeper into the teenage years, I am realizing that we have a lot of learning to do if we are to stay on top of things and help our kids become what God has intended for them to be. This poem touched my heart in more ways than one and I just had to share it. In my next post I”ll share what I’ve learned from my son and how his poem can be used as a guideline for a happy and loving family. I am from a family that my dad cooks pancakes. I am from cars driving from the road at sunset. 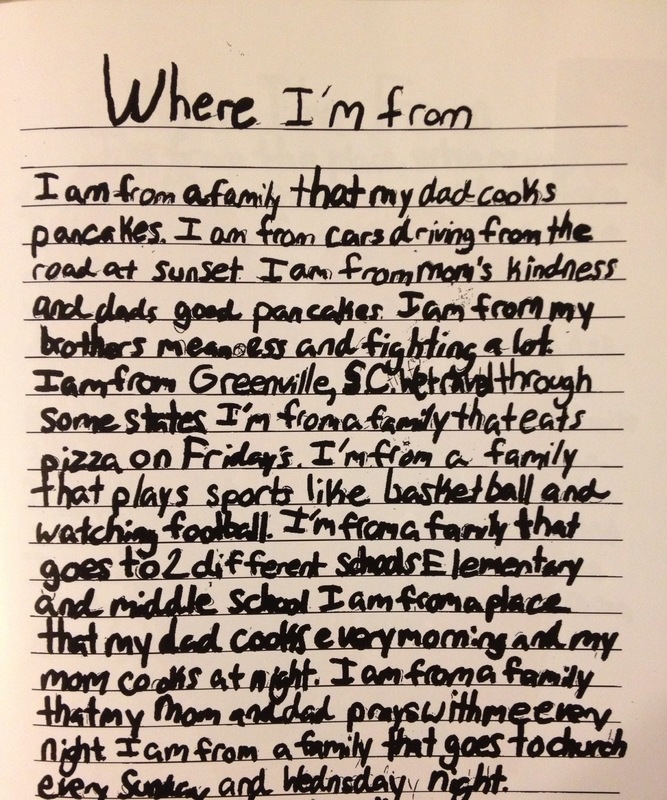 I am from mom’s kindness and dad’s good pancakes. I am from my brother’s meanness and fighting a lot. We travel through some states. I’m from a family that eat’s pizza on Fridays. I’m from a family that plays sports like basketball and watching football. I’m from a family that goes to 2 different schools, elementary and middle school. I am from a place that my dad cooks every morning and my mom cooks at night. I am from a family that my mom and dad prays with me every night. I am from a family that goes to church every Sunday and Wednesday night. Don’t miss the next post. Click on the “Follow” button on the right and enter your email address.